Imagine the excitement... You’ve played your way through qualifiers, besting the local competition. You’ve now made it to Vegas for the National Championships where over 2,000 of the country’s best players are standing between you and your goal. After several days of high-fiving friends, sweating every roll and finessing your way through the intense competition in a room filled with over 260 pool tables, you’ve finally made it the Finals. There is just one match left standing between you and the title of “2018 U.S Amateur Champion” and your piece of the $675,424 in total payouts. 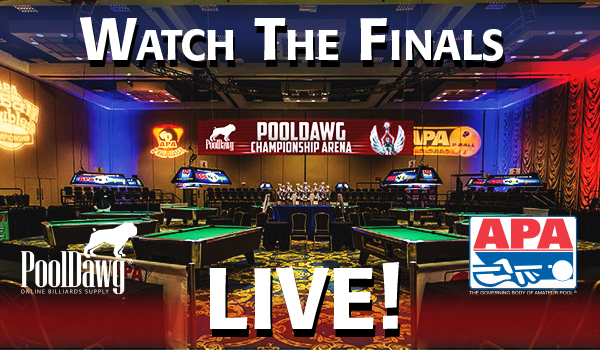 PoolDawg is proud to present these exciting final matches LIVE from the PoolDawg Championship Arena for the 2018 APA Poolplayer Championship and the 2018 World Pool Championships! PoolDawg is a sponsor of the American Poolplayer’s Association and its championships and has been attending these events for well over a decade. We have witnessed first-hand the quality of the competition and the passion for the game that is truly unique to amateur play and we are absolutely thrilled to team up with the APA to share these matches with the masses. Note: All times listed are Pacific Daylight Time (PDT) and are subject to change. The World Pool Championships will be held from August 9th to the 18th. 1st place winners of the 9-Ball World Championship receive $15,000 and 1st place winners of the 8-Ball World Championship receive $25,000. We will have a schedule of events when the tournament nears closer. This is the most renowned place for amateur poolplayers to compete and win against people around the world. Tournaments come and go, but the title for “U.S. Amateur Poolplayer Champion” lasts forever! The APA was founded in 1981 and is now the world’s largest amateur pool league with over 250,000 members and nearly 300 leagues across the U.S., Canada and Japan. The APA was founded with amateur pool players in mind. The league uses a “handicap” system called The Equalizer that allows for players of all levels to participate and win in these large tournaments. This brings various levels of skills and abilities together and is a great representation of comradery and why we all love the game. PoolDawg is actively involved in these tournaments and with this new level of sponsorship, we’re stoked to be able to bring the events live to people who aren’t able to make an appearance. Make sure to tune in! For updates on tournament info, products, and more, be sure to sign up for our mailing list and follow us on Facebook! Also, keep an eye out for exclusive APA Championship offers and specials for streaming viewers.